Detection of intracellular foreign DNA may be a key event in innate immune response. This process is mostly oriented toward response to bacterial infection, but several virus infection have been shown to trigger the innate immunity STING pathway. 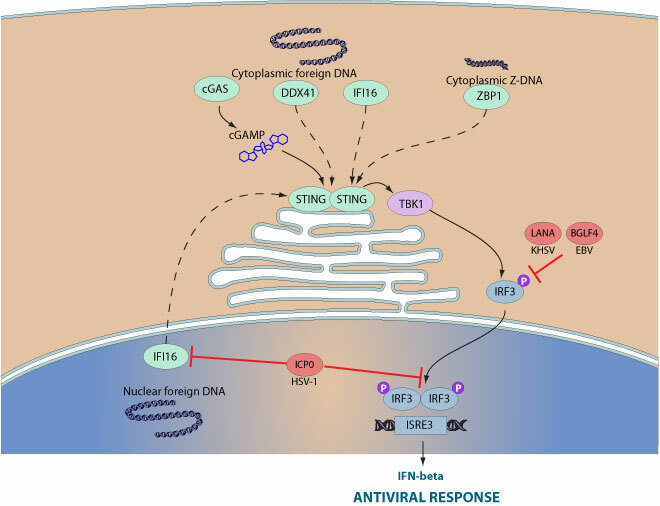 Several receptors have been described to react to cytoplasmic DNA and activate Interferon response through STING activation: ZBP1 , DDX41 , IFI16 and cGAS . IFI16 plays an essential antiviral role in nuclear viral DNA sensing. Herpesvirales do not expose their DNA in the cytoplasm, but still they induce IRF3-mediated antiviral response and this happens through IFI16 .The way IFI16 distinguishes self nuclear DNA and foreign is under investigation, but the signaling seems to rely on IFI16 assembled in filaments on viral dsDNA . Comments: STING pathway of interferon activation has been linked to RNA sensors RIG-like receptors, but it remains disputable. The link with dsDNA sensor is convincing, and this innate response seems to target both viruses and intracytoplasmic bacterias. The interferon response to intracellular DNA: Why so many receptors?